Bring a touch of class to your next party or event with our Milan Style Custom Square Plates. These unique Plastic Plates can be customized with any design and message you choose. 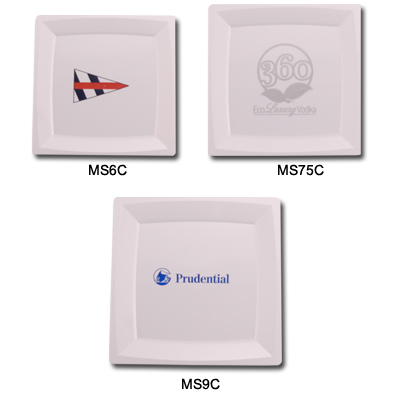 We offer 3 plate sizes in either clear or white with any imprint color you choose. It is easy to get started with our Custom Printed Plastic Plates, Just call 1-800-233-0828. 3" Diameter 3" x 3"
For additional information on our Custom Square Plastic Plates or our Bar, Nightclub, Restaurant, & Catering Supplies, including Lighted Ice Cubes, please contact us at 1-800-233-0828.